"Too much destruction is never enough!" Profile: Whether he's talking, terrifying or attacking, Overkill does everything to excess. 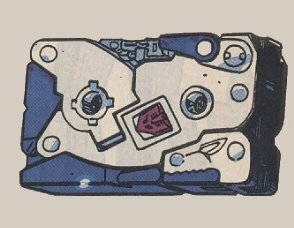 Other Transformers have been known to run out of fuel while listening to one of his interminable tirades. So excessively does he rant and rave that potential victims often assume the role of an audience, laughing so much at his theatrics that they forget about the threat he represents. On the battlefield, he's usually so busy proving how tough he is by snapping cars between his powerful jaws or flattening small buildings with a swipe of his tail that he loses sight of what he's there for. This often leaves him wide open to Autobot counterattacks. Even when he's actually engaged in combat he will sustain his attack long past the defeat of his opponent. Overkill talks a better fight than he actually fights. Abilities: Overkill can record messages when he shrinks to cassette mode, but he primarily uses this mode as a devious way to strike at opponents. Once he's sneaked up on them he transforms to his full-size tyrannosaurus mode and launches surprise attacks. In that form, he has tremendous strength. He can rip open the hull of a battleship with a single swipe of his titanium steel claws. He's armed with two batteries of motion missiles, which zero in on their targets by responding to the targets' movements. The missiles are sensitive to the movement of any object larger than a baseball. The best way to avoid getting hit by them - they explode on contact - is to stand absolutely still. Weaknesses: A defect in Overkill's transformation circuitry often results in him not being able to complete his transformations. 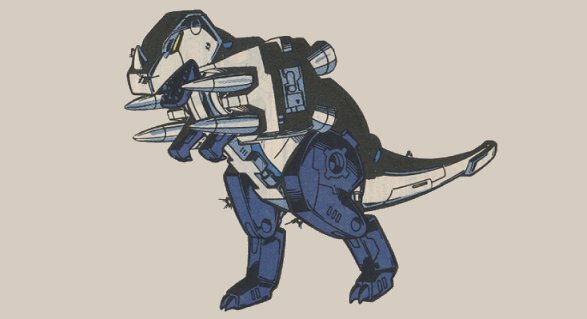 Specifically, he transforms from cassette to tyrannosaurus, but he's unable to grow to his full size. He remains the size of the cassette. When he's stuck at this size he's no more of a threat than a particularly vicious rat.